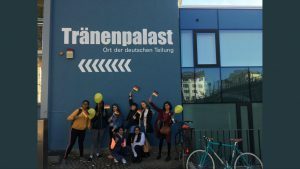 NGHS Languages trip to Berlin. Guest blog from Year 11. NGHS offers many trips to enhance the girls’ learning. 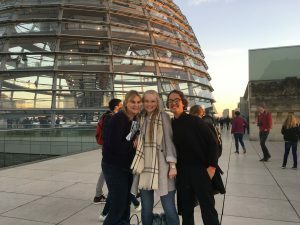 October half-term saw the Languages Department head off to Berlin. 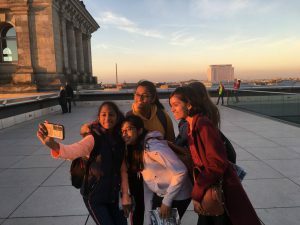 Guest blog by Anvitha Shetty, Year 11. 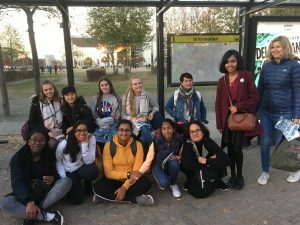 During the October half-term, a group of German language students went on an enjoyable and eventful weekend getaway to Germany’s famous capital – Berlin. Gaining a lot from this experience, I had many stories and fragments of history to share on my return home; it honestly will have a special place in my heart and the pages in my scrapbook. The trip was relaxing but definitely exciting. Our schedule was packed with numerous activities and locations to visit, which gave us all a varied sense of routine in comparison to school life. I can’t recall a time we stayed at the accommodation with nothing to do. We delved deep into Germany’s history, visiting The Berlin Wall, Checkpoint Charlie, DDR museums, the Reichstag and the Holocaust memorial. What was really intriguing was the way that all of the students showed a genuine interest in the history by asking so many questions. It was particularly powerful to read about people’s stories of desperation and longing for freedom. It was incredible to imagine how a country could be split into two completely contrasting regions. All of the people’s stories and information helped us to keep our minds open and our eyes curious. The artefacts, memorials, images and interactive experiences we saw were so tastefully done and helped us build an understanding and reminder that history must be accepted but not forgotten. Being able to use a language you learn in a real-life situation, was really rewarding and fulfilling. 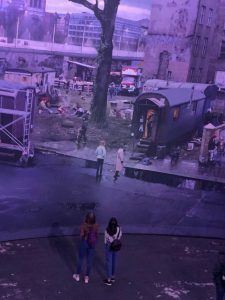 It was as if we took a section of our German classroom with us onto the streets of Berlin and the carriages on the underground became our classroom. Even if there were times when my fellow students and I didn’t fully understand anything, all of the other girls and the teachers never hesitated to lend a helping hand. We all know that travelling to a different part of the world can be a bit overwhelming. 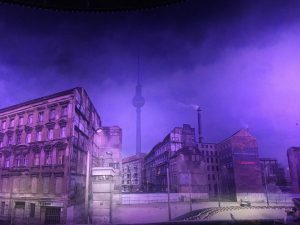 However, even in the vast Berlin city with all its whims and quirks, I couldn’t help but notice that I really felt at home. There was a particularly special moment when we went up on to the youth hostel balcony and the girls looked so thrilled because they were just having the very best time. I knew everyone was feeling something similar to me. Our Berlin trip gave us knowledge to learn, laughs to share, faces to see and pretzels to eat. I know it is definitely a place I will visit again. Bis bald Berlin!